January | 2014 | First Nations Film and Video Festival, Inc. Call for Entries for Spring 2014 Festival! 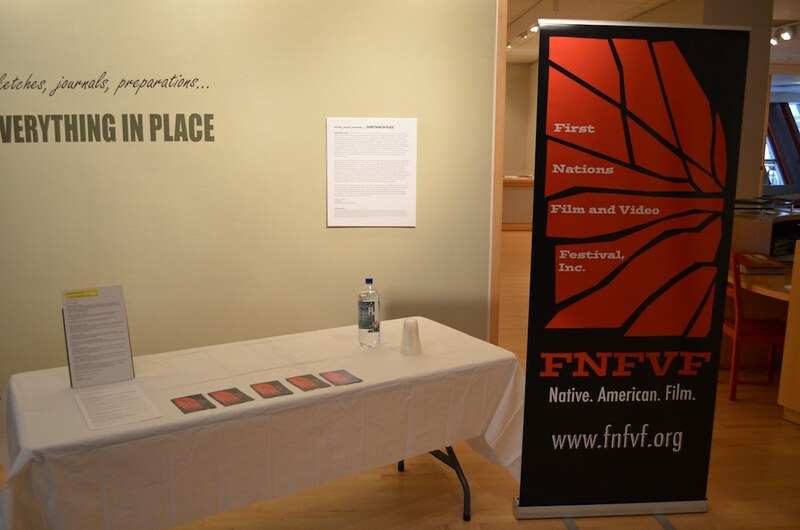 Chicago, Illinois) The First Nations Film and Video Festival, Inc. (FNFVF, Inc.) is now seeking film submissions for its Spring 2014 Festival. Native filmmakers are invited to submit films or videos of any length for inclusion. In addition to promoting films and videos from first–time filmmakers, the festival organizers are hoping to screen films from multiple genres and especially encourage submissions in the horror, sci-fi, and fantasy genres. Specific dates and venues will be announced soon. Go to our FESTIVAL APPLICATION PAGE for more information, to pick up a submission application. A New Year: Thanks from FNFVF, Inc. Here we are at the beginning of another year. Many take the time to look back and we are no different. What we do at First Nations Film and Video Festival, Inc. is very subtle. Yet, it is not very complicated nor is it a large dramatic movement that will create change immediately. Our plan from the time I took the reins in 2005 was to build our selves slowly, over time and ever so deliberately, put out our message of self-representation and first-voice in media. It is a hard line to hold. With so many films about Natives never really handing the reins of creative control to a Native director, because, for so long, the authority over the voice of Native Americans has never been in the hands of Native peoples. This makes the voice of Native people subject to those who claim a tacit expertise about Native American cinema and culture, thereby de-powering the voices of so many Native American film and video makers. Ours become hard guidelines to enforce and sometimes at the cost of relationships that could help further Native voice in media. But what does come though via our guidelines, and most especially this year, has been some of the most powerful and strongest of films about the Native American experience directed BY Native Americans. Our Fall 2013 First Nations Film and Video Festival is over. We screened three very strong feature films and several, convention-defying short films – from comedy to horror, from integrated ceremony to science fiction with some strong documentaries showing urban Natives in both North and South America, showing the contrasts and similarities of our peoples. It was a great fall festival, one where we were able to realize one of our long-standing goals. We would not be able to put out the message of Native self-representation and first-voice in film without the assistance and support of several people, organizations and funders. First of all, our thanks go out to all the venues that aided and supported our mission and the films we presented this year. To the Illinois State Museum – Chicago Gallery, Jane Stevens, Doug Stapleton and Kristy Chae for welcoming us this year and every year. The ISM Chicago is one of our most stalwart of venues, giving us a space and their support in presenting these films to a much broader audiences and helping us educate them about Native American culture and media. Once again, thank you to Chicago Filmmakers, who has provided their space to screen films that barely reach wider audiences but deserve to. With the help of Beckie Stocchetti and projectionist Jonathan, we know that we are not alone in supporting independent films from an overlooked community. Thanks to Jonathan Moeller and Nora Ferstead at the Beverly Arts Center who have come through and gives these films a great and receptive audience. 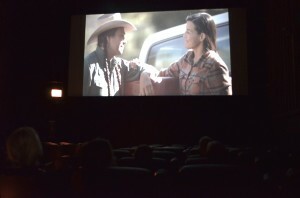 Every time we screen at BAC, the crowds grow and so does the enthusiasm for Native American films. This year, we realized a long-standing goal thanks to the Logan Theatre and Shaylah Paul, the General Manager. We provided an actual movie theater to screen a Native-directed film. It was great to see patrons walk up and order tickets (Even though the program was free!) and sit in a darkened theater. One of the many goals when Dave Spencer handed the reins of the FNFVF to me was that I would work my hardest to see that these films would play in movie theaters. Seeing a Native-directed film in a theater adds legitimacy to the film and can only serve to empower the filmmaker. Shaylah and her crew were great in helping us secure dates and time and with every detail of the screening. The smell of popcorn and the quiet of the theater during a screening of “The Cherokee Word for Water” (Which looked great on the big screen!) will be a lasting memory for us at the FNFVF! Thanks again, Shaylah! The audiences at Wheaton College are what the FNFVF is all about. Our primary target audience is students at colleges and universities and their on-going search for new perspectives on society and the FNFVF is proud to provide an alternate view in media for them Our thanks to Gene Greene and Judi Olseng for inviting us and hosting our festival ever so graciously. First Nations Film and Video Festival, Inc. wants to give a huge thanks to Scott Erlinder, Anthony Cheung and Allen Turner of DePaul University School of Computing and Digital Media. Your efforts are only a great beginning for the FNFVF at DePaul. We are looking forward to screening there again. Finally, our thanks got to the Citlalin Gallery & Theater and its director Gustavo Sanchez. 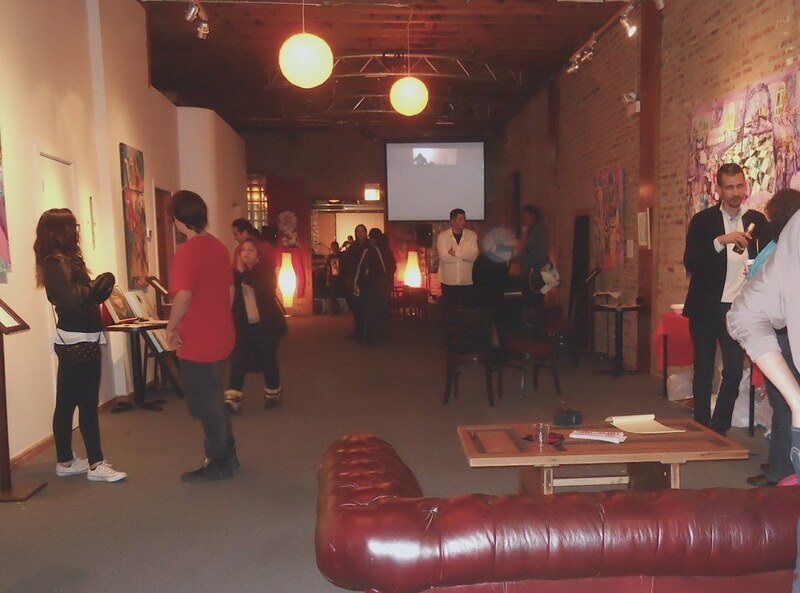 Gustavo works hard to provide us with a central location in a neighborhood that thrives on support of the arts. Gustavo is such a dynamic person with so many programs going on at the Citlalin, we are always appreciative in that he provides a space for us when we need it. Gracias, Gustavo. We were also part of the “First Annual Student Film Festival” at UIC that took place at the Latino Cultural Center. Our thanks go to Edith Tovar, Mario Lucero at the LCC and the Native American Student Organization’s Jonathan Medrano and Angelique Bodine for organizing the event. We wish them luck in the future. But the First Nations Film and Video Festival would not be a film festival without the hard work and dedication of the filmmakers, their producers and distributors who have been the most helpful to a festival such as ours. A big Thank You goes out to the Producers and Filmmakers of this year’s films. To Isael Maxakali and Charles Bicahlo, Director of the Indigenous Audiovisual Collective and Paje Films and their wonderful films Kokuphi and Xu Papoynãg and showing us “urban Natives” how to really balance ceremony and culture with living in modern society. Thank you to producer Lisa Olkin and Larry Pourier, director of “Urban Rez”. You powerful documentary touched many of the hearts of the Native people here in Chicago. We hope to bring your film to wider audiences here with future programming and screenings. Much thanks goes to Pamela Peters for securing the many great short films we screened this year. Also to Steven Judd, Roberto Jackson, Sydney Freeland, James Lujan, and the Creative Spirit Class of 2008 – Kim Gleason, Bryanna Antone, Lane Samuel, Branson Benally and Rhett Lynch, the directors of those films. Thank you to producer Louise Belenger and director Yves Siouee Durand, the makers of “Mesnak”. “Mesnak” garnered many positive and thoughtful responses. It is a hard-hitting movie and does not turn the gaze away from the hard and uncomfortable slices of life. With such a powerful and eloquent ending, we hope to see more from Durand at our festival. Thank you to producer Cara Marcous and director Andrew Okpeaha Mclean for providing his two great films “On the Ice” and “Children of the Northern Lights”. Both films truly defy the expectations of what a Native filmmaker should be doing and both were highly praised for their expert of craft, storytelling and acting. Great job to Andrew and Cara. We look forward to seeing what you do next. Last, but not least, so much thanks to Melanie B. Sweeney and co-directors Charlie Soap & Tim Kelly the makers of “The Cherokee Word for Water”. You made such a wonderful film that speaks to community involvement in situations that are typically difficult to work through. You story and Wilma’s vision meshed well in such a great movie. We will try our best to support your efforts to bring the film to wider audiences. This year, FNFVF, Inc. became a 501c3 organization and this has helped tremendously in securing our films and gaining support. We have many funders to thank in our preparation and execution of the fall edition of the First Nations Film and Video Festival. Our biggest thanks goes to the Crossroads Fund, whose dedication to serving organizations that promote social justice and activism. What we do here at FNFVF, Inc. is subtle but can have a lasting impact; empowering Native peoples to tell their own stories, in their own voice or supporting their efforts at putting out that voice to general audiences. With support from the Crossroads Fund, we were able to secure screening rights for our feature films and to meet our long-standing goal of a theatrical screening of a Native-directed film. To Jeanne Kratcher & Cindy Iberra at the Crossroads Fund, our thanks! Thanks to the Smoking Buddha Shop in Pilsen. Your support means the world to us and to our community. To Jemima Sanchez for her support of our efforts at our first ever fundraiser. We cannot thank you enough for all you have done. To Nicki Viso, student, who, from so far away felt that our cause was important enough to help us out. Thanks Nicki. FNFVF, Inc. is not a “Tier A” film festival, it not Sundance or Toronto. 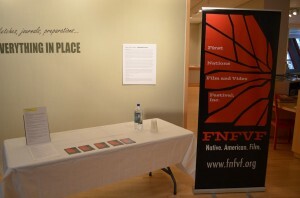 It is simply a no-walls organization, with a great board and a Director who does all he can pro-bono, to provide all audiences with a free and open festival, without cashing in on the Native-directed films, because we at FNFVF, Inc. believe in Native American first-voice and self-representation and that to screen these films empowers the filmmakers and strengthens their voice. Lastly, but definitely not least, our biggest thanks goes to each and every one of you who braved the weather and the start times to come out and see these rarely screened films. Your interest in the films and your seeing them at our venues is so important to our mission and to the filmmakers’ visions. We hope that you will follow along with us as well continue to provide Native-directed films and for your continued support of Native American first-voice and self-representation in film and media.